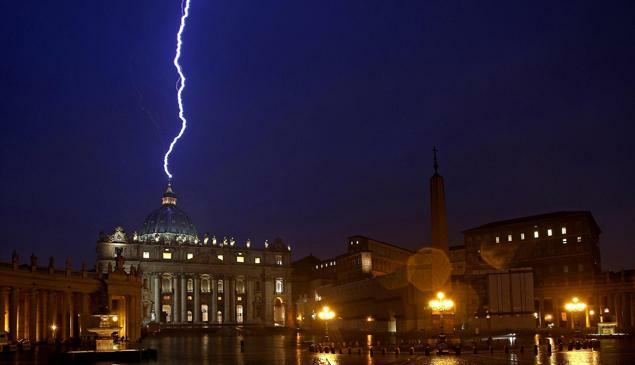 Just hours after Pope Benedict XVI announced his retirement, due to failing health, St. Peter's Basilica, in the Vatican, was struck by lighting. The event was photographed by Alessandro Di Meo, and a colleague initially. He told the BBC that when the images went public they were met with great skepticism. He said "I understand that the picture may be incredible. Photos of lightning have always been done, but the only difference, in this case, is that it is the right place and at the right time." However, when the footage below came to light all skepticism dispersed. One cannot blame the public's skepticism with the uncanny timing of the lighting hitting the earthly resting place of the Catholic Church's first pope on such a historic day.